FAQ | Live.Love.Pet! | Honolulu, HI - Live.Love.Pet ! Hawaii's Only 'Zen' Grooming Spaw & Boutique! Frequently Asked Questions - Got Questions? We've Got Answers. The questions below are separated into three sections - General Questions, Dog Questions and Cat Questions. If you don't see your question listed here, contact us and we'll be glad to answer it! 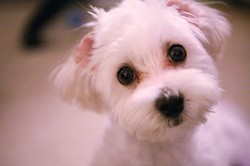 Q: How Should I Drop My Pet Off to Your Honolulu Dog Grooming Salon? A: Dogs can be brought in on a leash or in a pet carrier. We prefer that all cats be brought in using a pet carrier. To ensure that your pet is seen right away, and that we are familiar with your pet's specific needs, please complete our pre-groom evaluation form prior to your first visit. Q: Will My Pet Be Placed in a Kennel? A: Yes, all pets under our care will be placed into a kennel immediately upon arriving. This is done at our Honolulu dog grooming salon for your pet's protection. The sanitized and clean kennel will be labeled with your pet's name and will include fresh water and a lavender infused blankie. 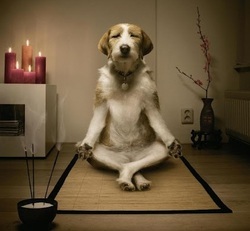 That, along with the soothing music we play for puppies (and we even turn the lights out for relaxation), your pet will begin to feel 'zen' just in time for the grooming appointment. Q: Are Your Kennels Cleaned After Every Appointment? A: Yes, of course! All kennels are cleaned and sanitized with a pest and germ killer between every appointment. Occasionally we will sanitize the kennel for the very same pet, especially if we notice that your pet has fleas and/or ticks. 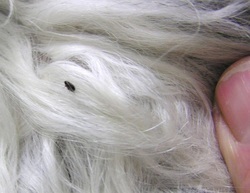 Q: What if You Notice Fleas or Ticks On My Pet? ﻿A:﻿ While we do offer flea and tick treatments, we will refuse to groom flea or tick infested pets. We don't like to refuse service to anyone, but an infestation puts our pet grooming salon and every other pet under our care at risk. If your pet does have a flea and/or tick infestation, we ask that you provide a vet-provided or store-bought treatment (Such as our "I See Fleas" enhancement package - Advantix for dogs and Advantage II for cats) and then wait 12-24 hours before bringing your pet back to our Honolulu pet grooming salon. If you need help with this process, please contact us at any time. However, if your pet only has a few fleas or a few ticks, let one of our Honolulu pet groomers know and we will happily help you remove the pests for good. Ask about our flea and tick removal services. Q: How Long Does A Pet Grooming Appointment Typically Last? A: Most pets will require 3-4 hours to be groomed properly. We never like to rush our appointments and, after all, your pet deserves our complete and undivided attention. Of course the duration of your appointment will depend on which Honolulu pet grooming services you choose. Generally speaking, if you ask us at the time of drop-off, we will provide you with an estimated pick-up time. While we do have a pet supplies boutique that you can browse while you wait, we never want you to wait too long for your pet's groom to be finished. A: Our goal is to make every aspect of your pet's grooming appointment simple and easy, including payment. For the convenience of all our Honolulu pet grooming customers, we offer several payment options. You can pay with cash, write us a check or you can use your credit or debit card. We accept Visa, Mastercard, Discover and American Express. Q: What If One of Your Kaimuki Pet Groomers Are Bitten By My Pet? A: This happens more frequently than you might think. 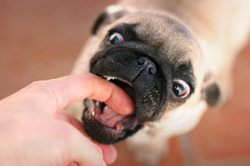 As Honolulu pet groomers we must take every precaution, because some pets simply don't like going to the grooming salon. It's understandable. After all, the grooming salon smells just like the vet's office. No wonder your pet is freaking out! 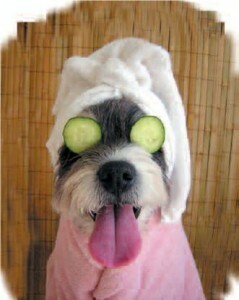 Our job is to make the pet grooming appointment stress-free for everyone involved. To help your pet relax and to decrease the chances of bites or scratches occurring, we use a combination of calming scents, aromatherapy and kennels stocked with lavender infused blankies to create a calming and 'zen-like' experience. You can also decrease the chances of your pet hating the groomer (or scratching and biting one of us) by bringing your pet in to our pet grooming salon in Kaimuki Honolulu while the animal is still young. Q: How Old Does My Pet Have To Be To Visit a Honolulu Pet Groomer? Can My Pet Be Too Old? A: We love pets of all ages. For best results, and so that your pet has a chance to get used to the groomer early-on, we recommend that you begin regular grooming appointments by twelve weeks of age, after the vet has administered all the necessary vaccines. This helps us create a loving and positive first experience - a bond that translates into a far easier experience on you, your pet and our grooming staff. If you are worried about your pet being too old, we recommend that you ask your vet to get a professional opinion. However, no matter how old and wise your pet happens to be, we will gladly groom him/her, as long as we have the vet's approval. 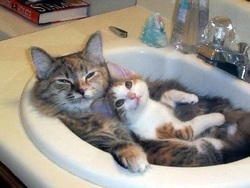 We may ask you to accompany us throughout the grooming experience for the health and safety of your senior pet. Q: What if My Pet Has Special Needs? A: If your pet has allergies, specific diet requirements or if there are any grooming requests you'd like to leave for our grooming staff, we ask that you please complete the pre-groom evaluation form prior to your appointment. The form provides us with your contact information, specific requests, concerns and other information we can use to make your pet's visit highly-personalized from beginning to end - and from head to tail. 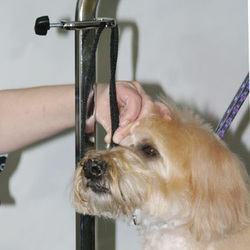 Q: Do You Use Muzzles During the Grooming Process? A: While we never like to muzzle pets under our care, sometimes it is necessary to protect your pet and our groomers. We typically only use muzzles during specific treatments, such as nail trimmings. A muzzle is always a last resort for us. Hopefully our soothing environment decreases the need to use a muzzle. For those times when muzzles must be used, we keep Groomers Helpers on all of our tables for added protection and for everyone's safety. Q: Do You Use Sedation Drugs To Calm Pets Down? A: NEVER! We use a combination of aromatherapy, kennels stocked with lavender infused blankies, tranquil music and lots of praise and kisses to keep your pet calm. However, we may ask that your pet be given a prescribed sedative from the vet prior to your appointment, but we will only do so in extreme cases. Please be HONEST if your pet might act naughty during his or her spaw day experience. Q: How Do I Maintain My Pet's Beautiful Groom At Home? A: To keep your pet's groom beautiful (or handsome) as long as possible, we recommend that you bring your pet in to our pet grooming salon in Honolulu for regular appointments. 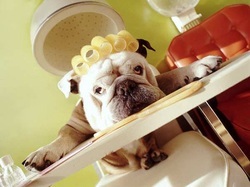 Ask about our full range of pet grooming services that will always ensure your pet looks picture-perfect. In addition to regular grooming appointments, we always recommend regular in-home care! Ask your certified Honolulu pet groomer to develop an at-home 'Zen' health and groom regimen to ensure that your pet is only getting the very best care both in and out of the salon! Choose pet shampoos that are ideal for your pet’s coat type. And make sure the formula used is soothing on your pet's skin. And don't forget regular dental care, which can actually extend the life expectancy of your pet. Selecting the right brushes will help with unwanted shedding and reduce the risk of brush burn. And it never hurts to give your pet a treatment for fleas and/or ticks. For better care, coat and quality of life, ensure that you are feeding your pet the very best food that fits within your budget. 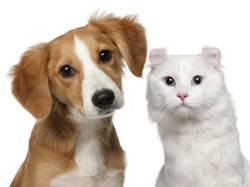 Incidentally, food allergies are the third most common source of discomfort and itchiness in most pets! Selecting the right food with the right mixtures of proteins and carbohydrates can improve your pet's quality of life, leading to a happier and healthier furry best friend. Q: What If I'm Not 100% Satisfied? A: If you are not happy with any part of your experience, please let us know so that we can make it right. 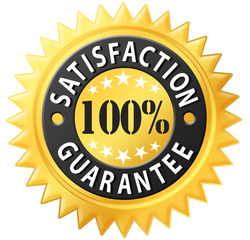 That's all part of our 100% Pawsitively Purr-fect guarantee! We value your business, but mostly we value our promise to keep your pet beautiful, comfortable, healthy, and kiss-ably clean! 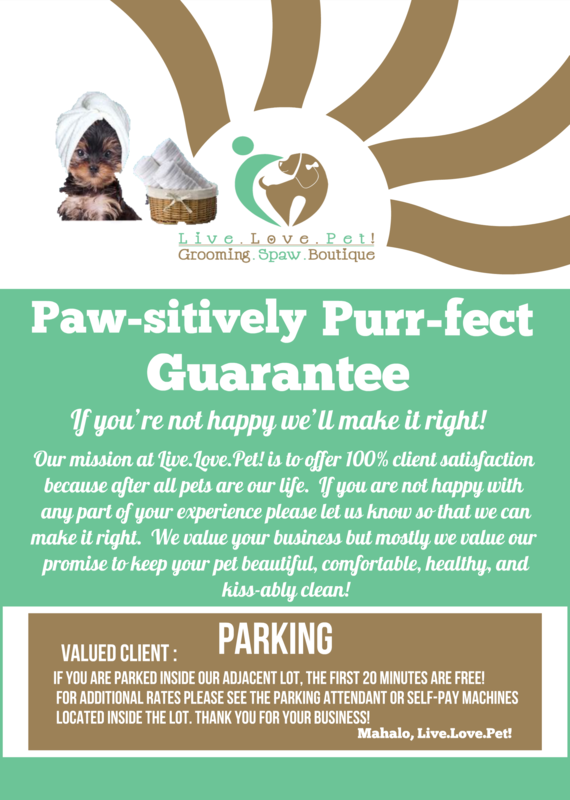 That's just part of the unique service you'll only experience at Live.Love.Pet! in Kaimuki, Honolulu. Mahalo!